Left home 12.30, lunched at Pt Wakefield and reached Mambray Creek rest area for the night after 250km today. Called D and P for quick chat. Compiled a TWF (Things We Forgot) list. Went shopping in Pt Augusta for all the things on our TWF list and got most of them, and fuel. 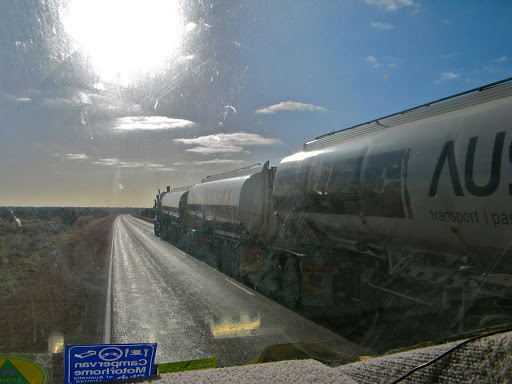 While doing 90kph on the Stuart Highway north of Pt Aug we were overtaken by huge road train, and 75000 litres of volatile fuel moving at 110 kph is something you don't want to get in the way of. 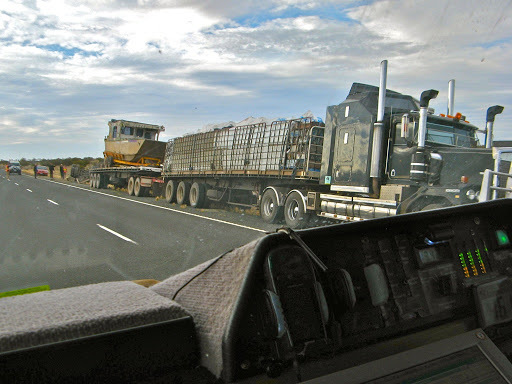 A stone thrown up from another road train made a large chip in the windscreen beneath Vinko's a/c label. It will probably spread to become a $400 insurance claim. Camped at the Bon Bon Campsite after a tiring 400km drive. 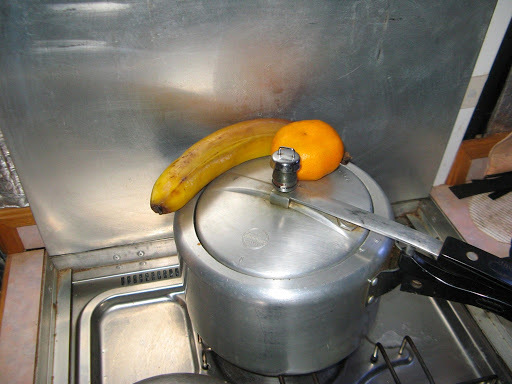 Defrosted fruit from an over zealous fridge on the lid of the pressure cooker filled with stew. J thinks there's a mandarin missing. Is there a mandarin missing? Called in D and P with a shopping list of things we will run out of and possibly can't get more of along the GCR, like fresh veggies. 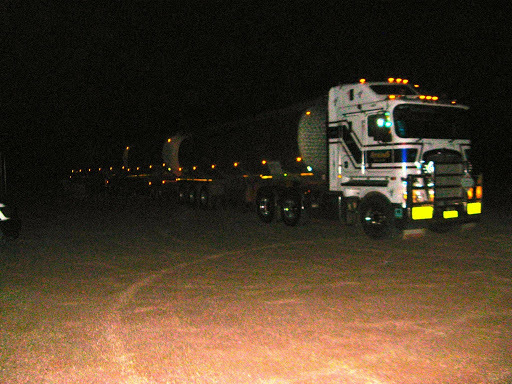 Road train parked in our rest area ablaze with lights. A very cold night, the GPS and Reversing Camera both declined to work initially. I had to prod the camera wiring with my bit of expanded aluminium that I had found by the roadside. (Luckily I had ignored all suggestions to throw it away). I also had to reboot the computer to get the GPS module to respond. We called in at Coober Pedy for water, more last minute shopping of TWSF (Things We Still Forgot) list and fuel ($1.695). Sadly the cheap fuel place (Bulls) has closed down but the Mobil store half way though the town was much cheaper than the Caltex roadhouse. 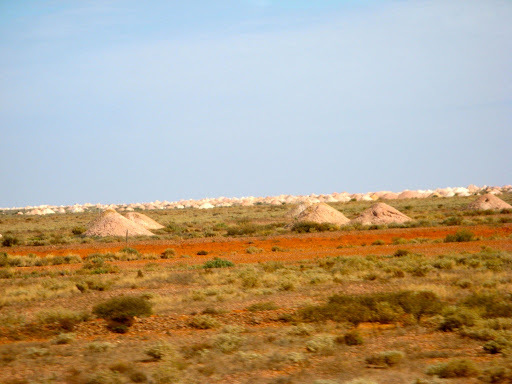 North of Coober Pedy there are many flat topped mesa hills, part of an ancient land which is almost completely worn down except for very hard materials protruding from the surface, such as mesa hilltops and road signs. J saw a burnt out double decker bus in a paddock, or it could have been a burnt out cattle truck, both of which performed the same basic function. Later we came upon a police roadblock for an overturned road train trailer. Pallets of crushed cans littered the verge plus what appeared at first glance to be an upside down small car which we feared might have been involved in the accident. Fortunately I think it turned out to be a small car trailer probably fallen from the road train, since it only had 2 wheels. It looks like the 3rd trailer of the road train wandered off the bitumen and overturned, spilling it's load. Some truck driver will have some explaining to do. J claimed to have seen Sturt Desert Peas but this remains uncorroborated by a competent botanist. We bypassed Marla since we needed neither fuel nor sustenance and camped at the Chandler Rest Area. We've done 431km today and 1081km total, in 2 1/2 days. Oka going pretty well, now cruises at 90kph quite happily (previously it was only happy at 80kph) but of course higher cruising speed equals higher power equals higher fuel consumption (7 down to 6 km/litre). The replaced injector pump seal and air filter housing presumably makes a difference. Only 314 km today but a pretty good day's drive, passed into the NT but passed up fuel at Kulgera at $2.10 . Called in at Erldunda for fuel ($1.97) and had lunch. 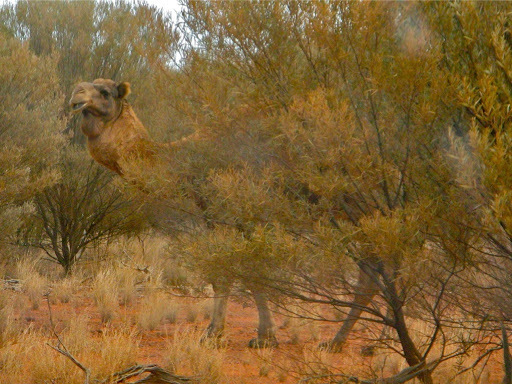 They have emus to gawk at and Telstra coverage so we checked the internet and sent emails re dishwasher to MS and A. We found our first flies today (or did they find us? ), not too many and the sleepy winter variety, but a portent of things to come. W drove down the Lassiter Highway to the Mt Connor Rest area for the night. A beautiful camp site amongst Desert Oaks. We saw a "We Drive on the Left in Australia" sign, not outside an international airport or ferry terminal as you might expect, but on the Lassiter Highway in the middle of Australia! You'd think by the time motorists got this far they would have worked that out. There were plenty of people at Erldunda, long queues at the pumps, but very few on the Uluru road, and almost no tourist busses whereas the area used to be infested with them. No more busloads of Japanese tourists. The Finke Desert Races are on this weekend which may account for some of the Stuart Highway traffic. J doing washing, nice dry wind but cool and sunny. Everything dry by evening except woolly socks which always take days. Tomorrow we'll move to Yulara to do shopping, refill gas bottle, top up fuel and water and head out Sunday morning for the Great Gravel Central Road (GCR) west. We stopped to look at Mt Connor, which is a very impressive mountain and we don't see why it hasn't been opened up for more tourism. 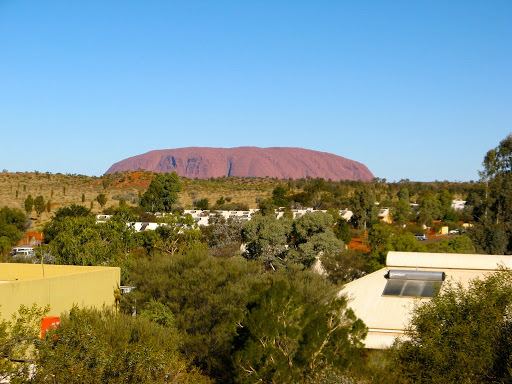 It's totally different to Ayers Rock or the Olga's but in the same vicinity on the same road. In fact geographically the three are all aligned and about the same distance apart. It's on private land so the only access is via a few specialised tours (flights etc). Surprisingly there is a nice but unnamed salt lake just behind the sand dunes north of the Mt Connor lookout. 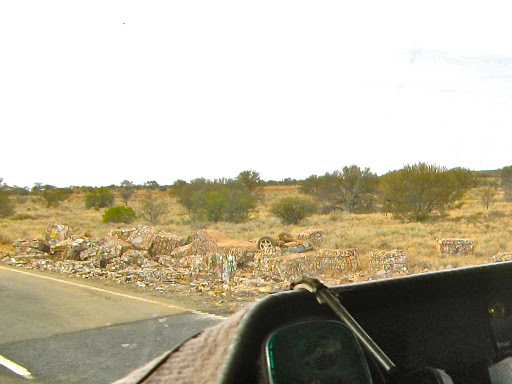 We found the dump point in the Yulara industrial area, near a bus maintenance facility. Supermarket shopping at Yulara was pretty good and not as expensive as expected. Topped up gas bottle (2kg for $9.90) and fuel ($2.13/l), both less than expected. Spoke with A on phone. Radio reception was completely ratshit due to the electrical noise emanating from Yulara village so I just assumed D and P could hear me (which he could) and asked him to check Pauline's Facebook page where I had written some notes. D and P called later and we arranged a radio schedule 12:00 WA time (1:30 CST) the next day, to discuss a possible delay/route alteration due to storms in SW WA. Left Yulara campsite and passed through the NP entrance without having to pay the $25 per person entry fee since we had a permit to travel west on the Great Gravel Road. Nevertheless, we did a circuit of The Rock anyway in gloomy overcast conditions, quite unlike the spectacular sunshine of yesterday. We struck out for the Olga's in similar conditions but carried on west on the GCR. 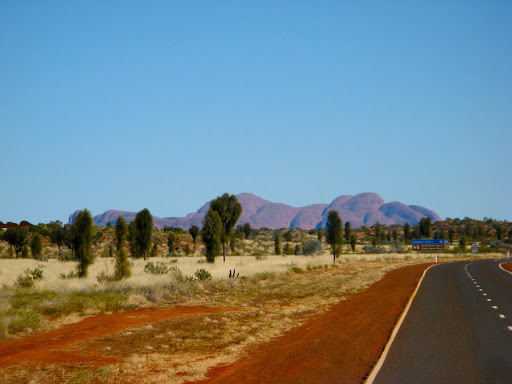 We reminisced about the "old" days when you could drive all around the domes of the Olgas and could even climb some, but not now, one road, one car park and only 2 defined walks you can take. That means that 90% of the Olga's treasures can no longer be experienced. An unintended consequence of the Mabo decision. The GCR has mostly been regraded recently and was a pretty smooth drive for 150kms until we reached Docker River Aboriginal Community where it returned to its original corrugated sandy state. But just after starting down the GCR, a large camel darted across the road in front of us. A couple of seconds later and we would have collided with him a-midriff. That would have been catastrophic for both him and us. A ton of camel has a lot of inertia and his body could have ended up in the cab and that would have been the end of our holiday, our Oka and possibly us as well, we have a bull bar but it's not a camel bar. We never thought any of that at the time of course, we just stopped quickly, took some pictures and carried on. On a good day the GCR would be a nice drive. It's a wide, 1000km lonely gravel road which extends from Alice Springs to Laverton, but most people would never have heard of it let along driven along it. 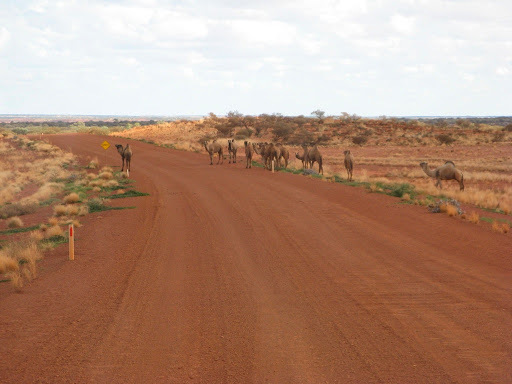 It's relatively smooth (ie a fair bit of sandy/gravelly corrugations more suited to a 4WD but not caravans) and not a difficult or tortuous drive but it is very remote with only 3 or 4 roadhouses at 300km intervals with minimal facilities and absolutely, totally, nothing in between except a scenic desert environment. No Maca's or RAA services out here, you're completely on your own. And you need some (free) aboriginal permits to use it. 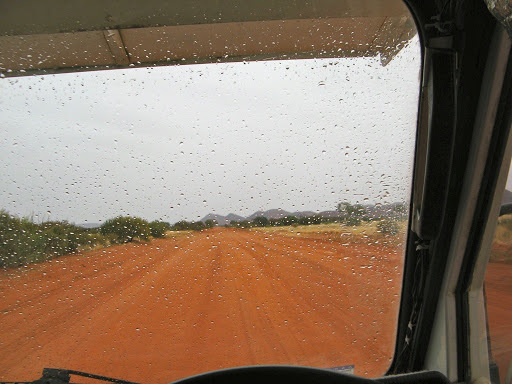 But the rain started soon after the camel incident, not a lot, just a gentle but annoying pitter patter on the windscreen, but it carried on like that all afternoon. (Post writing note: and all night). Fortunately the track is sandy so it hasn't turned into a quagmire, yet. The Great Central Road with a few spots of rain, otherwise a nice wide open track. At lunchtime we stopped at Lassiter's Cave, where, in January 1931 he sheltered for 25 days after his camels bolted taking all his possessions, food and water. He was searching for his mystical gold reef which he claimed to have first discovered 34 years earlier. He really should have noted its GPS coordinates. 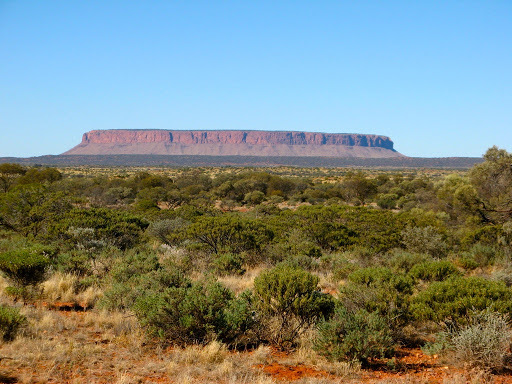 Anyway, after 25 days cave life, with only 1.7 litres of water and the support of a local aboriginal family, he started walking the 140 km east to Mt Olga (in mid summer) hoping to find his relief party. 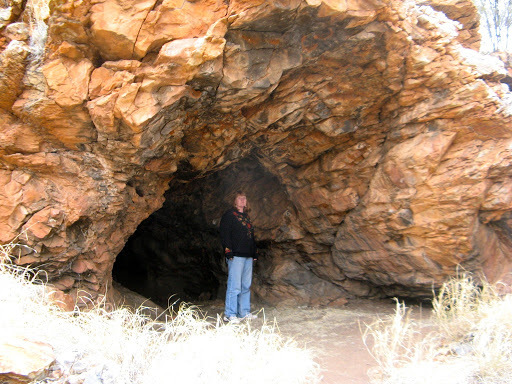 He made it only 55 km before he died, taking the secrets of his gold reef with him. We are travelling in mid-winter and none of the creeks we've crossed have any water in them. Did I inherently know all this historical stuff? Nope, I just copied it off the signboard. While at Lassiter's Cave lunch spot we erected our big antenna and made contact with Dave and Pauline who were somewhere in WA, afflicted by the severe storms. Gravel roads on their planned route were likely to be affected by rain so they were seeking an alternative all-bitumen route to meet us on the GCR. We'll contact them again tomorrow to reassess the situation. We had noticed water leaking from the top of the main water tank while driving but not when we were stopped. I presume one of the breathers on top of the tank has either broken or got knocked out when we filled up with high pressure water from the Coober Pedy water facility. I need to investigate and fit something else to keep out the dust while allowing air to breath in and out, like a washing up sponge held on with aluminium tape or tie-wraps. In the meantime we have no need to rush, and since the day was gloomy and damp, and we could see none of the interesting terrain, we stopped for the night at the Docker River campground, Kaltukatjara. 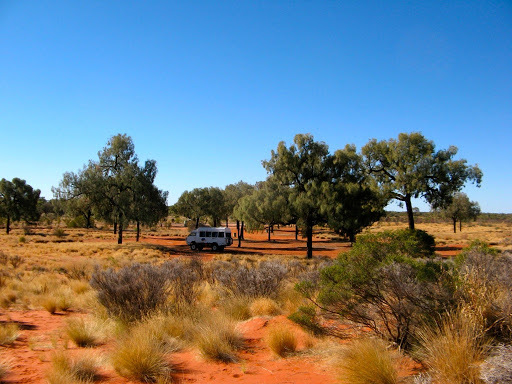 It's potentially a nice spot, sandy camping areas set amongst weeping desert oaks and surrounded by red sand dunes, but sadly, like most things Aboriginal, it's suffered from neglect, vandalism and lack of management. The toilets are woeful with no doors and there's no water in the pipes. 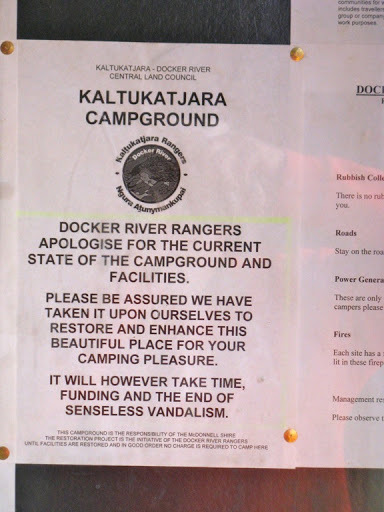 There is a full page notice in the entry hut apologising for the state of the campground and promising to rectify the deficiencies whenever they could but "it was hard work". There is supposed to be a camping charge but they can't even get that organised. Nothing has changed since we were last here in 2007. Fortunately J liberated a late issue of Women's Weekly from the Yulara laundry so she has some very interesting articles and crosswords to do. Contacted D and P, route still inconclusive, will contact again at midday tomorrow. Water leak turned out to be nothing more than water slopping about and coming out of the breather, both of which are present and correct. The rain disappeared overnight and it was bright if not sunny as we headed west again towards the WA border and down to Giles Met Office (which runs on SA time). Nothing stirred there or at the Warakurna roadhouse. We stopped at the junction of the Old Abandoned Gunbarrel Highway and called into D and P. They are coming up the GCR to meet us as their original route is too iffy, weather wise. The GCR is now much better than our previous trips and is a 75-80kph gravel road if you keep an eye out for dips and sandy patches, and camels. We stopped by Len Beadell's Sandy Blight Junction Road plaque, even though it's now 9km from the actual junction due to a road realignment to an aboriginal community. Sadly I noticed an oil leak from the front diff so I'll have to keep topping it up. Frustrating because I replaced the seals 2 years ago (which is a week's work involving removing the differential assembly and all the hubs, bearings, brakes etc) and unblocked the breather pipe last year. We passed through the Shire of the Longest Name but were saddened by the signs imploring us to keep unleaded fuel locked up or handed to authorities for safe keeping whilst in their area. It got quite hot and sunny for a while, I even tried out the a/c, before clouds re-came-in and we finished the 300kms to Warburton. We refuelled at $2.43/l and are staying in their campground overnight, but apart from access to water, there are much better free desert campsites to be had. 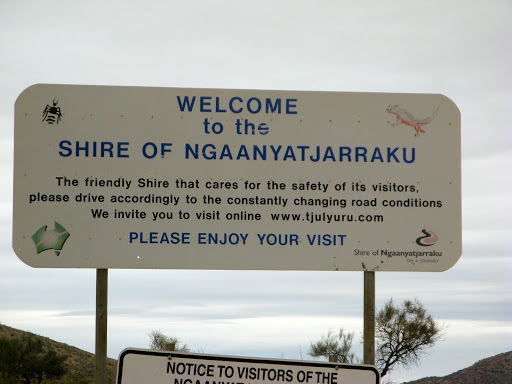 Tomorrow we'll meet up with D and P at Tjukayirla Roadhouse (which I call Chuckalolly Roadhouse), 250kms further west. Continue our trek here, across 2500km of desert tracks to 80 Mile Beach.